As The Seattle Times put it, “the beautiful Kate Lindsey nearly walks away with the show” in The Tales of Hoffmann. This mezzo-soprano plays Hoffmann’s trusty sidekick as well as his creative inspiration with impressive vocal range and agility, comedic timing and onstage charisma to spare. She has enchanted audiences at The Met and Santa Fe Opera in the same role. Seattleites first fell in love with Kate when she took the title role in the 2010 world premiere of Amelia, and then as Rosina in the 2011 production of The Barker of Seville. Next year in 2015, she will return to McCaw Hall to sing The Composer in Ariadne auf Naxos. When you sing the role of a man, what is different? My costume informs me tremendously in the way I choose to move. In general, I adjust my stance to avoid the dancer's "turn out" that I tend to have. The hips are more straightly aligned, and I'm more grounded in my movements. In terms of thoughts and feelings, I personally don't think, in our deepest essence, that men and women are all that different from each other—society has just imposed certain restrictions of thought and feeling onto each gender. Therefore, I choose to allow the text to guide me through this discovery of the humanity within the character rather than focusing overtly on playing into an ideal of gender. Kate Lindsey (Nicklausse) in rehearsal for The Tales of Hoffmann. 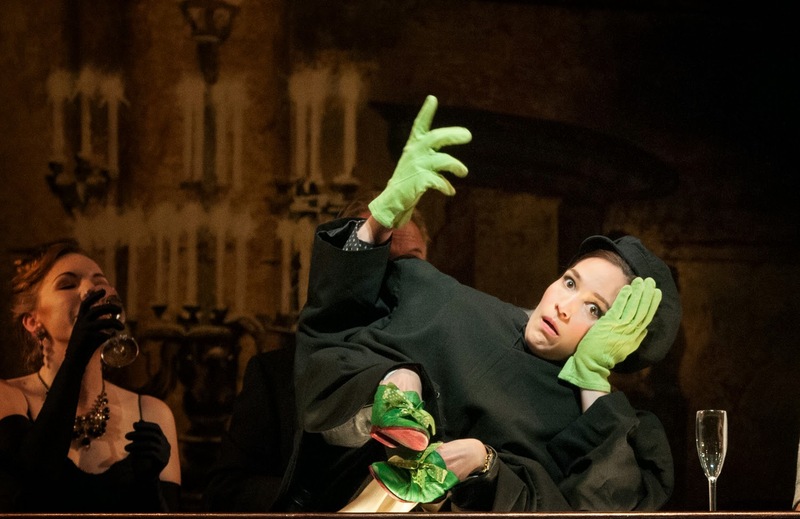 Kate Lindsey (Nicklausse) in The Tales of Hoffmann. 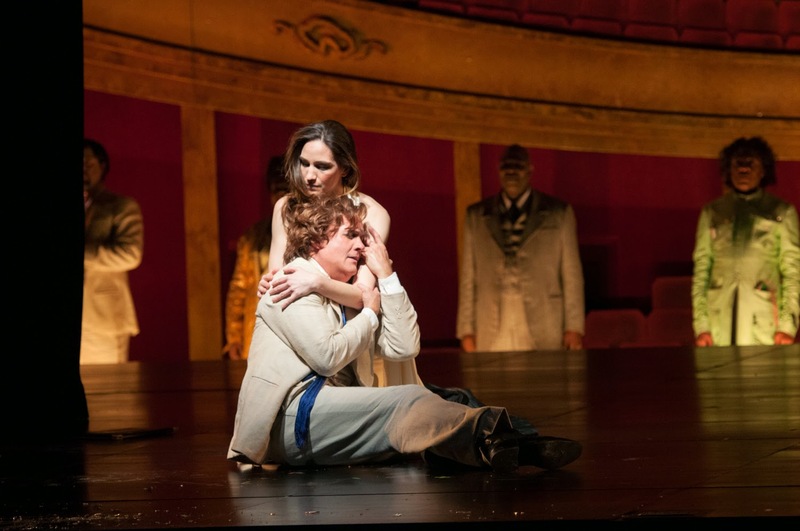 You were in The Met’s Hoffmann broadcast in live HD. Do you have to perform differently when you know people will be seeing you close-up? On stage, I pretend there's always a close-up on my face, HD broadcast or not. Personally, if I am not maintaining that absolute focus of subtext, which comes through in the smallest ways, most especially in the eyes, then I know I'm completely out of focus and absent within the present moment. I have a feeling that the audience is very attuned to this, as well, even if they are sitting far away and can't really see the facial nuance. I like to think this sort of focus can still be felt deeply, even in the biggest opera houses. 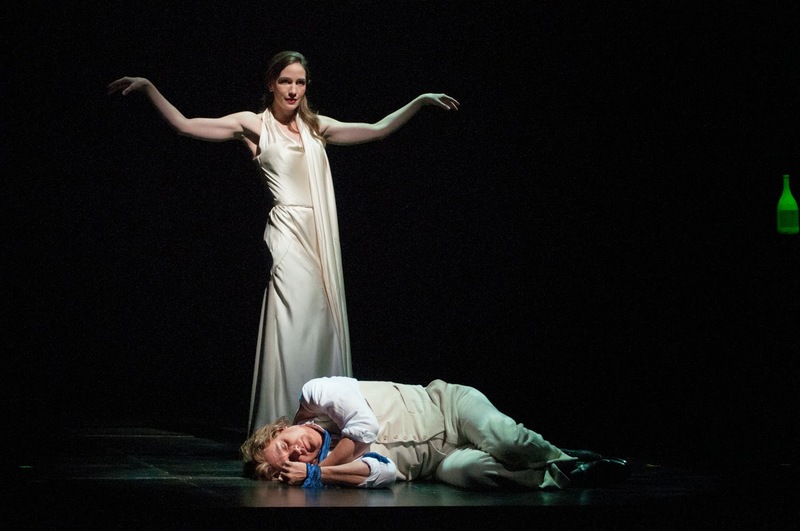 Kate Lindsey (The Muse) and William Burden (Hoffmann) in The Tales of Hoffmann. Some old recordings omit the scenes with the Muse. What do you think she adds to the opera? I think she actually adds some sense, that is continuity, to a story that can actually start to feel really confusing. I believe that she represents Hoffmann's inner voice, which is working desperately to be heard so that he can fully realize the depth of his artistic genius. The Muse acts as an internal psychological guide for Hoffmann; that internal voice, an intuitive force, which we all have inside of us. I now ask myself frequently if I'm truly listening to my Muse, my intuition, as I walk through life. Are you listening to yours? How would our lives change if we could take more time to honor that voice within ourselves? What do you think you’re really saying when you sing the “Violin Aria”? “Go inside, listen! Stop fighting against your inner truth and your gifts! I am your violin. I am your Muse. I am love. Surrender to your Muse, and you can then be free from the deepest fears within yourself.” (That’s not a direct translation, but it's my general subtext). Do you have a moment in this opera? From right: Kate Lindsey (Nicklausse) with William Burden (Hoffmann). You’ve worked in Seattle with Stephen Wadsworth, Peter Kazaras, and now Chris Alexander. What do you look for/hope for in a director? Laughter, honesty, gentleness and friendship. Wait, is this a dating website? Wherever I can get a really good night's sleep. The location or city is never as important as the quality and fulfilling nature of the work. That can make any place a whole lot more beautiful. Do you still travel with your dog? Shelby, the sweetest rascal of a dog, travels with me quite often. I always encounter interesting new friendships as a result of walking with her and meeting other wonderful "dog people." She warms my heart. I always say that she was a rescue dog, but in fact, she rescued me even more than I rescued her. 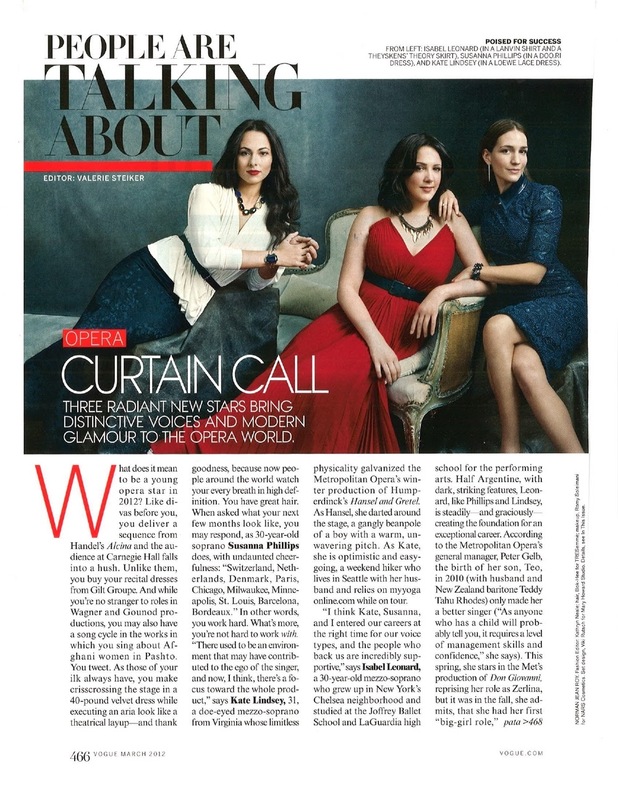 Kate Lindsey (far right) with Susanna Phillips (center) and Isabel Leonard in the March 2012 issue of Vogue magazine. Tell us a little bit about the fashion shoot at Vogue! The Vogue photo shoot was a bit of a blur—it all happened so quickly. I got to visit the Vogue offices a few days before the shoot to try on some clothing possibilities. It was completely surreal to be there after having watched the documentary The September Issue about Vogue. Then, the stylist took some sample photos with clothing options, and she said, "I just have to run these by Anna before we select what you will wear"... Yes! That was (Editor in Chief) Anna Wintour! My gosh, I just about melted there, even days before the photo shoot! The actual shoot was really great. Everyone was extremely nice, and they were quite impressed with how easily us opera singers could follow direction. We all had a nice laugh over that afterwards. What do you like about coming to Seattle? Coffee! And warm yoga studios! This is Speight’s last production as the company’s general director. What has Speight meant to your career? Speight's faith and encouragement have been overwhelming gifts in my life. I admire him deeply as a mentor and a friend. Singing the role of Amelia was a huge turning point in my growth, personally and professionally, and I couldn't have dreamed of working in a more supportive environment. I admire so much his contagious enthusiasm and passion for opera. 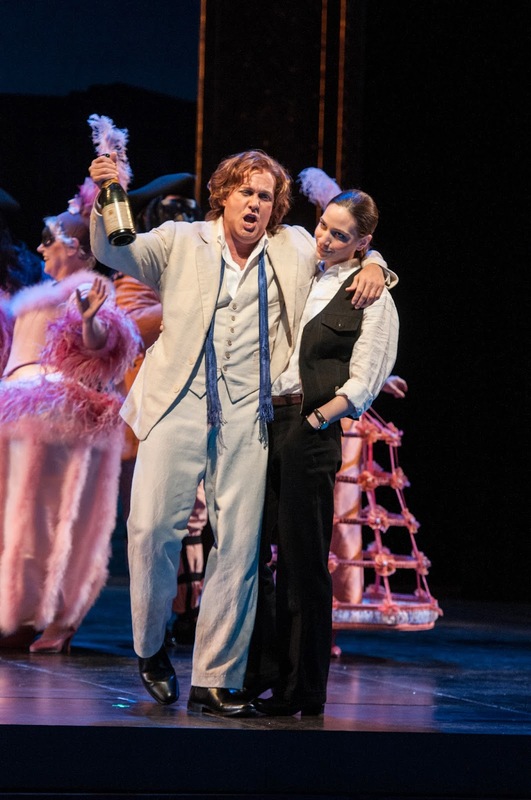 The Tales of Hoffmann, Retiring General Director Speight Jenkins' last production with Seattle Opera, plays May 10, 14, 16 and 17 at McCaw Hall. For tickets, go to seattleopera.org/hoffmann.